People close to Amy Winehouse have revealed the singer left behind a trove of unreleased music - but no decision has been made about whether it will be released. Spokesman Chris Goodman said there is "plenty" of material, but there have been no discussions yet about bringing anything out. The Guardian newspaper quoted an unnamed spokesman at record label Universal as saying Amy had left the "framework" of about a dozen songs. The tragic star, 27, released only two albums, but had been in the studio sporadically over the past few years. 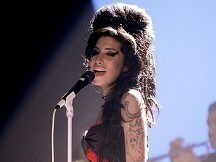 Amy, who fought a well-publicised battle with drink and drugs, was found dead at her London home on Saturday. Sales of the Rehab singer's music have soared since her death. In the US, digital sales of her tracks have risen by 2,000 per cent in the past week. Dolly Parton has revealed the craziest gift she's had from a fan - a box with a baby named Jolene inside. Olivia Newton-John's daughter Chloe Lattanzi has insisted her mother understands her decision to star in a controversial music video. Gary Lightbody has revealed how the band has received "care packages" of Irish tea while they are out in LA. After the birth of her sixth child, Lauryn Hill wants to clear up two things: Rohan Marley didn't abandon her while she was pregnant, and he's not the baby's father.